Already the end of September!!!! I'm not sure how it got here so quick! The hummingbirds have moved on and we have had just a hint of fall weather here and there, although it's still in the 80s and 90s most days. Cooler temperatures are on the way though which means the lovely fall weather will soon be upon us. I'll be posting several charts over the next few days, including the football chart I forgot to post last month. 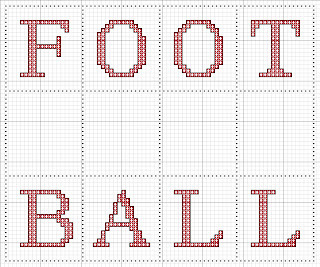 I haven't stitched it up yet (I'm not much of a football fan - baseball is for me!) but I've seen charms at Hobby Lobby that would work nicely in the open squares. Some of the charts I have stitched and finished, some have been stitched but not finished (One is supposed to be a stand-up if I ever drag out the sewing machine to put it together! ), and some have been designed but not stitched. If anyone stitches any of them up, I would love to see photos, if you would like to share them. I also want to thank all the visitors to my blog that have left encouraging comments for me! It means more to me than I ever thought it would and has moved me to begin to leave comments for others on their blogs to encourage them as well. Pay it Forward! your blog is very themebase for kids who likes footballs to play and original players also.